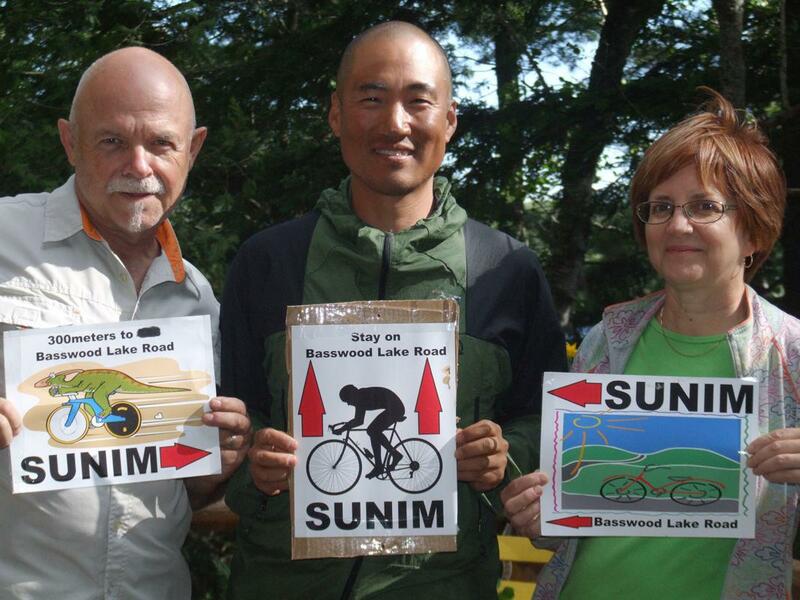 This morning we said goodbye to our Korean Buddhist monk visitor who has embarked on a 2 year cycling trip across Canada, the US, down through Central and South America all the way to Patagonia. Sunim belongs to a city temple in Seoul. He started his odyssey two months ago not knowing anyone in Canada and with very little English. He is 42 years old and cycles in waterproof sandals, the kind with the velcro straps! He had the good fortune to meet Dave in BC who first helped him with a flat tire, subsequently hosted him, then set up the Facebook page about his trip and now devotes numerous hours each day helping Sunim secure hosts along the way. Dave contacted us through Couchsurfing and that is how we came to host him. When he does not have a host, he sleeps in a small tent somewhere he deems appropriate along the highway. Our first evening together was rather short as he arrived just in time for supper and he was ready for a shower and bed by 8:30. Yesterday it rained from early morning until about noon. Then the sun came out for the rest of the day. He spent a quiet morning on his own, updating his blog and resting. After lunch we took him to see a German friend, Dagmar, who is a potter and has a workshop in her home in the middle of a forest on a neighbouring lake. She owns 144 acres. Her husband (deceased a few years ago) worked with wood and other types of media. Sunim commented that he felt like he was in a museum. He took pictures of a large wood sculpture in the workshop called the "breathing torso." Then the three of us walked 1 km to her waterfront and Andrij took a photo of Sunim sitting on her dock with his feet in the water. Dagmar owns 1 km of shoreline and another large portion of shoreline is Crown land so there are no neighbours and it is a very private place. We stayed there 15-20 minutes as it was very peaceful and the sun was warm. That lake is called Big Basswood Lake (approx 11 kms long). Our home is on Little Basswood Lake (3-4 kms long and not nearly as wide as Big Basswood Lake). Upon our return to the house, we took Sunim for a boat ride around our lake and he said that our lake was a big lake, no doubt because during the boat ride he saw some additional bays that are not visible from our house. Had there been time, we might have taken him for a boat ride on Big Basswood - then he would have really seen the difference in size between the two lakes. During the boat ride we saw a loon not too far from the boat. Back at the house I showed him a loonie and a toonie and explained how both coins got their names. From what I could tell it was the first time he heard that our $1 coin is called a loonie. Sunim was not interested in fishing as he does like the concept of using a hook to catch fish. We learned that his dad was a fisherman and used nets, so that could be why. After supper Andrij and I played a game of Cribbage while Sunim shadowed my card hands and pegged the points. He also played some of my hands for me in the second half of the game. He found it a little complicated but was catching on by the end. Then he and I played a few rounds of Rummy 500 and he understood that game from the beginning. I'm not sure what he thought of the card games, but he was open to trying something new and different. We often have lovely sunsets on the lake here at our home that we call Blisswood. Last night was a particularly lovely sunset in a clear sky and on water that was smooth as glass. Clouds and trees were reflected in the water and Sunim commented on how peaceful it was and used an expression something to the effect that it seemed that the world had stopped. I think he really appreciated the beauty of the 10 or so minutes that we stood on the dock watching the sun set. It was a pleasure having Sunim stay with us. He did not hesitate to let us know when he was hungry or wanted more to eat, if he was cold and did not want to remain outside or when he was ready to retire to his room for the night. Always in a very respectful manner. He showed us pictures on his laptop of his life as monk as well as previous Canadian hosts. Also we learned that his hobby is relief wood carving and he showed us some pictures of his work. Andrij, on his own bike, accompanied Sumin this morning for the 3 kms from our house back to Highway 17. He watched him disappear down the highway and commented to me that in his green hat and jacket, he looks like a green lotus flower floating down the river going a leisurely 8-10 kms an hour. He referenced the lotus flower because Sunim had shown us photos of his temple where the ceiling is covered in paper lotus flowers because of their profound symbolism in the Buddhist world. In brief, the lotus symbolizes the purity of heart, mind and speech and the blossoming of wholesome deeds. Prior to posting this blog I shared it with some friends, one of whom quickly identified the following spiritual truths from the story of Sunim’s journey. 1 -- The Universe will provide for those who trust. 2 -- When our hearts are open, there is no language barrier. 3 -- Because all of mankind is one, when we give to another, we receive. 4 -- We have angels on Earth who are aiding us during Life's voyage. Simply receive their help, trusting at all times that it is there. 5 -- There is beauty everywhere, if we have eyes to see. She wants Sunim to know that she is sending blessings his way since he is here quietly teaching us all how to live and we are receiving his gift.